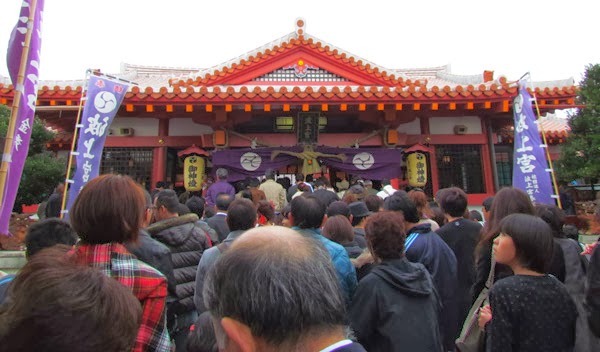 It is a Japanese tradition to start off the New Year with a visit to a Shinto Shrine. In Japanese this is called hatsumode (hatsumōde, はつもうで, 初詣) which literally means “first visit to a shrine”. Typically, families try to go on the very first day of the New Year. Others, because of their work schedule for example, may attend on the second or third day. 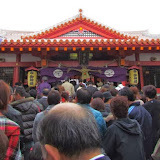 Usually, people visit Shinto Shrines for hatsumode, but they can also visit Buddhist temples with the same aspirations. 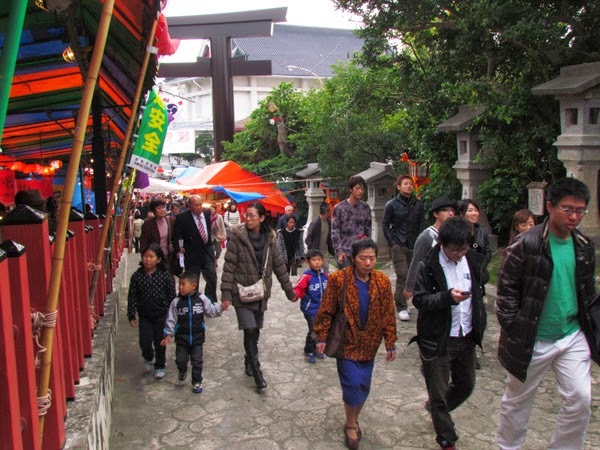 Some Japanese or Okinawan people choose to go to a certain shrine (or shrines) based on personal or local beliefs. This could depend on the person's zodiac sign and/or the upcoming zodiac year. 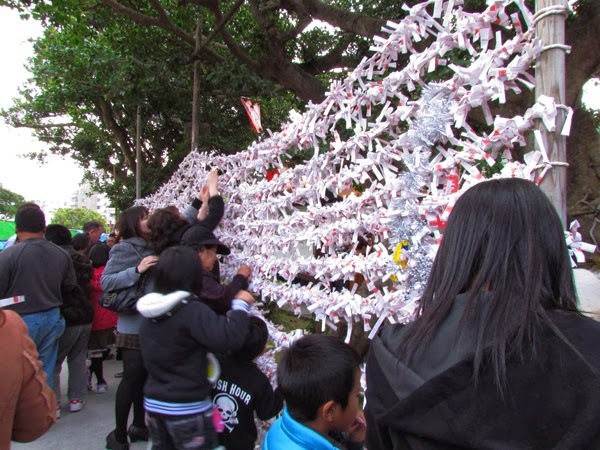 The Naminoue Shrine is without question the most popular Shinto Shrine in the Ryukyu Islands. Many people visit here on New Year's Day. Below is the general sequence of events on visiting the shrine on this occasion. With a few minor exceptions, it is no different than visiting any other Shinto Shrine on any given day. If you feel uncomfortable going alone, ask a Japanese friend to accompany you. 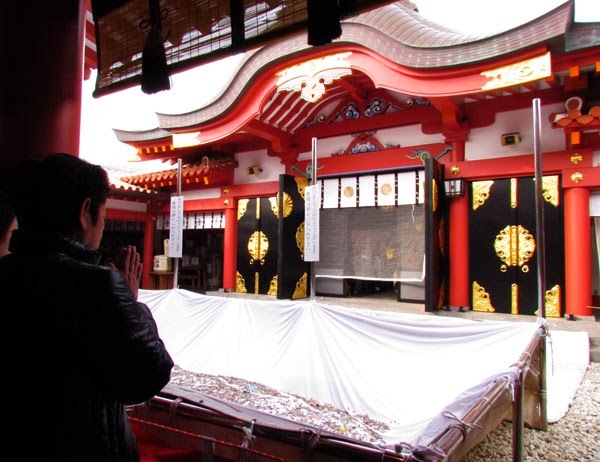 Staff members at Naminoue are accustom to foreigners attending this shrine. You need not fear, just go with a little humility and patience. Date: January 1st starting at midnight usually to January 3rd or longer. 1. Entering the Premises. Enter the Naminoue Shrine through the torii gate. The torii gate lets travelers know they are about to enter a sacred area. It is considered proper etiquette to stop and bow just before you enter. 2. The Purification Fountain/Cleansing of the Body. The following is based on questions and interviews with various Japanese and Okinawan people. 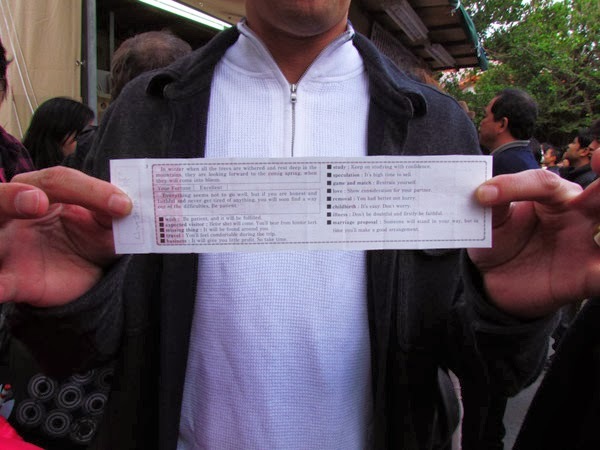 No official guide can be referenced on this process and not everyone may follow these steps exactly. Some may even skip it all together. But the below guidelines are the most complete. It is recommended that you observe others during this process first. The fountain at Naminoue will be on your left if you are facing the Main Prayer Hall (haiden, 拝殿). Step 1. Approach the trough and with your right hand, pick up the ladle and scoop the "pure water" from the basin or fountain. Step 2. Pour the water to clean your left hand. NOTE: When you are washing your hand do not let the water fall back into the pure water basin after cleansing. Let the water rinse off on the outside of the basin onto the ground. This prevents the now "soiled water" from falling back into the pure water basin. Step 3. Next, take the ladle with the left hand and pour the water over your right hand using guidelines in Step 2. Step 4. (Optional) Next, you are to clean the body by taking the ladle with the right hand and making a cup with your left hand. Pour water into your left hand and then pour it into your mouth. DO NOT SWALLOW IT or GARGLE LOUD. Just rinse it quietly in your mouth for a few seconds and quietly spit it out onto the ground. Try to do this in a very respectful manner. Step 5. Finally, you will take the ladle with your right hand again, pour some water into it and tip the ladle up so that the water pours down the ladle. You are now cleansing the ladle. 3. 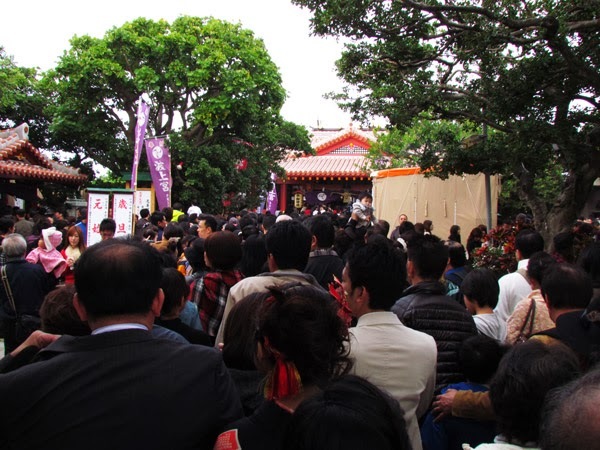 Standing in Line/Approaching the Main Prayer Hall (haiden, 拝殿). On New Years there will be a long line in front of the Main Prayer Hall (haiden), but it moves rather quickly. As you approach the haiden, normally you would find a saisen box where you would deposit your monetary offering (saisen). In the case of Naminoue during New Years this box may not be present. Because of the expected large crowds, coins are thrown in an open lot instead. Most people deposit somewhere between 5¥ to 100¥. 4. Prayer. After you make your monetary offering, bow and clap twice and say a small prayer in silence. You will either exit to the left or right as people behind you step forward. Omikuji/Omamori. After you have made your offerings and prayers, a common custom is to then obtain your fortune for that year. This is called an Omikuji. It will be a little folded-up paper with your fortune on it. Typically you pay a small sum, such as 100¥ and then you randomly pick it from a box. At Naminoue, you can ask for an English version. It is traditional to then tie your fortune on a place provided. 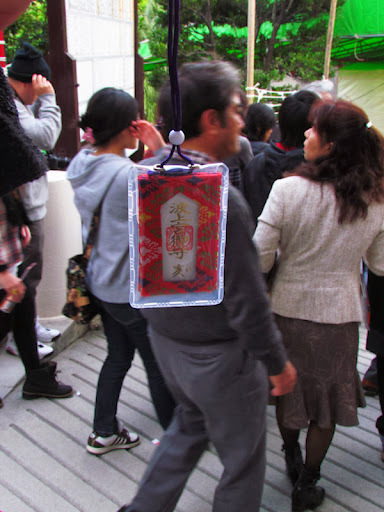 You can also purchase an Omamori, which is essentially a good luck charm. There are varieties to choose from and some serve specific purposes. For example, you can purchase an omamori for exam testing or driver safety. Most people tend to get one for general health and prosperity. Parking. On New Years Day parking will be problematic. Fortunately, most people do not stay very long and thus there will be a continuous flow of people leaving. 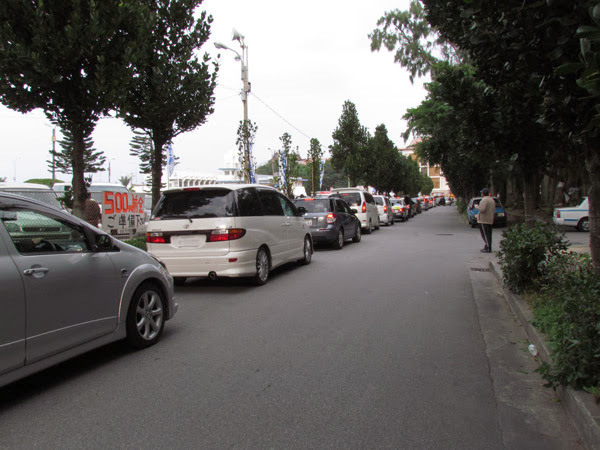 Additionally, near the shrine you will find parking attendants moving the traffic along. 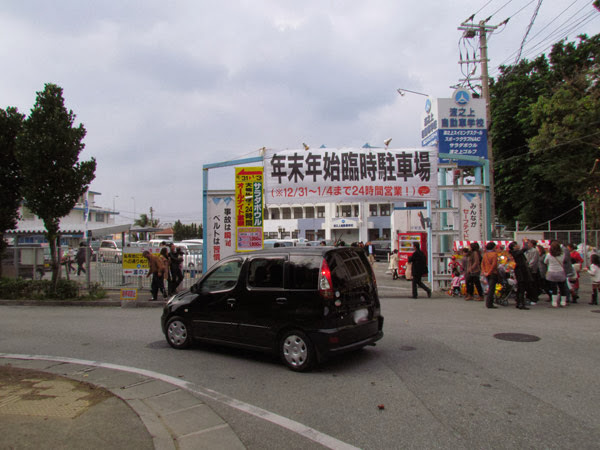 People also park at a distance and then walk to the shrine. 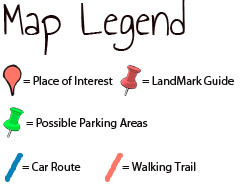 The Green Thumbtack icon in the map above is the parking lot closest to the shrine and closest to the main road. Other parking attendants may direct you to other parking locations. You will most likely see a steady flow of cars lined up. Expect to wait anywhere from 20 to 30 minutes. This could vary based on the time of day. You will have to pay to park, typically around 500¥. Other parking locations may vary. Directions. Because of the lack of Highway signs, written instructions will be more complicated. Please study the map carefully. The Blue Route is the easiest to follow from Highway 58. The Green Route however may be easier to access the parking area but little harder to navigate to. What to Bring. Plan for cold weather and rain no matter what the forecast. Bring an umbrella, warm coat, Yen/change, and a camera. Is that Mario, I see, in the thumbnail below ?